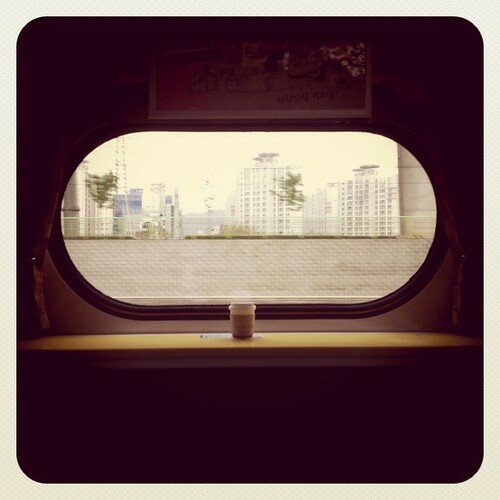 Stepping out of my charming Itaewon hovel, I made my way to Yongsan station and hopped on the early morning train to Jeonju. I’m used to traveling by bus and on the KTX, but this was my first experience of the 새마을 (Saemaeul) train service and I was pleasantly surprised. A very different kind of iPad. 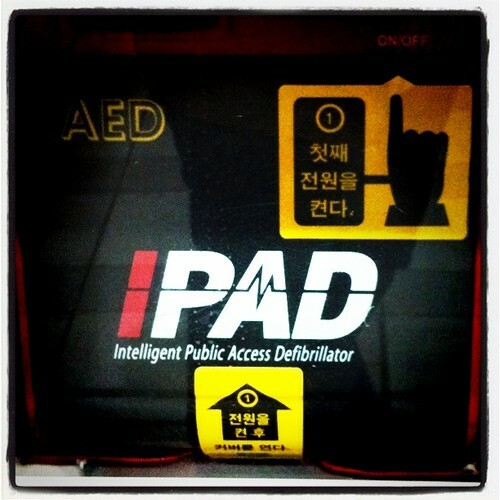 Seen at Seoul Station. Spacious seats and plenty of legroom made the three hour and 10 minute journey more than bearable (as did the price, 25,400 won, much cheaper than the KTX), but it was the train cafe that really enhanced my trip. The ability to get up, wander to the dining car and have a coffee is something missing from the KTX experience, but with the Saemaeul and the Mugunghwa trains you’re allowed to dine or drink in a little more style. The hazelnut coffee is still just as bad as the KTX, but sitting on a bench facing the window is just a little more romantic and feels far more cultured than just being stuck in your seat. 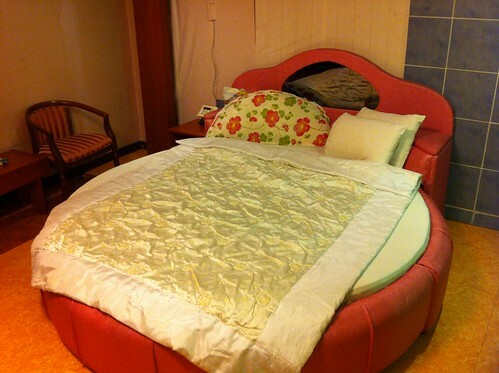 Everybody loves a circular bed. After dumping a fair amount of my belongings, I took the JIFF shuttle bus and headed down to the JIFF Press Office to pick up my pass (Thanks to 10 Magazine for the credentials) and my tickets. A press conference filled with people I should have recognized was taking place as I picked up my goodie bag and after lingering for a while to listen to the celebrities, I made my way into downtown Jeonju to score some lunch. Press conference filled with people I have never heard of. 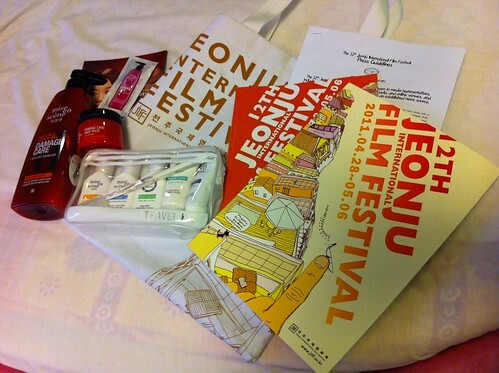 The JIFF 2011 Goodie bag. A word of warning: If you’re peckish and you don’t fancy fast food, then the cinema street may not have what you’re looking for. You’ll have to walk a little bit further to enjoy the culinary delights of Jeonju. Unfortunately I was pressed for time and so ended up walking round in ever decreasing circles until I found a branch of School Food. I’ve heard much said about this upscale kimbap restaurant, but this was the first time I had the chance to sample their delights. A quick scan of the menu, did little to excite me, but one dish popped out from the page and I decided that it would be remiss of me if I didn’t try the “Carbonara Topokki”. Fusion School Food for 8,000 won and surprisingly decent. 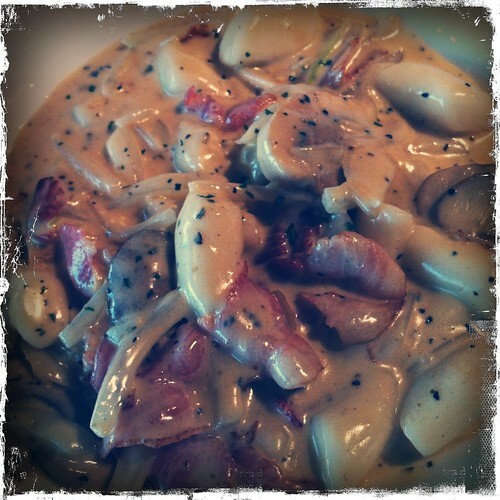 The sauce tasted like something you might get at Sorrento, but there was plenty of bacon and the rice cakes worked well in the rich creamy sauce. Not my ideal lunch, but it did the job and was much better than expected. 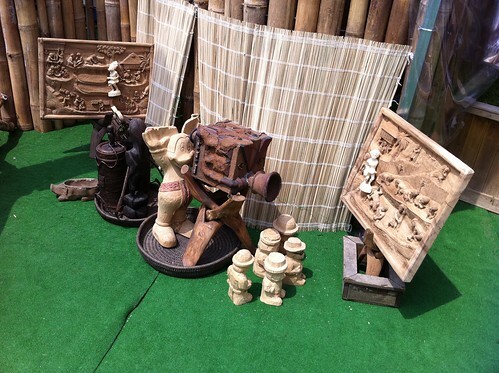 Filled with cream and rice starch, I started to make my way to the Jeonju Megabox Cinema, but first popped into one of the open festival areas. There I chanced upon an exhibition by Filipino director Kidlat Tahimik (His name means Quiet Lightning). 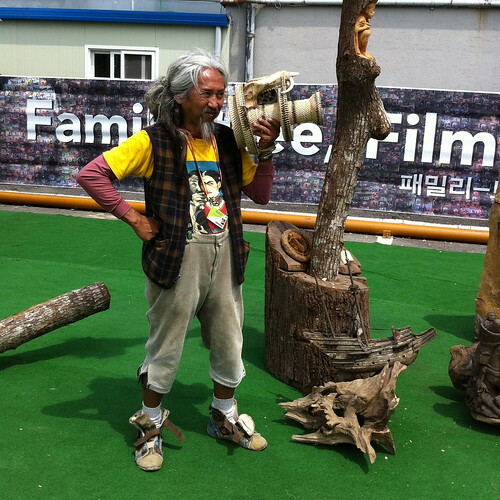 Kidlat Tahimik poses with his alternative camera. The festival was showing a retrospective of his works and he had brought over a collection of sculptures to commemorate the occasion. Each of the tableaus he had created showed the conflict between tradition and Hollywood, with teams of native film-makers either creating work based on local stories or trying to copy Marilyn Monroe. I was fortunate enough to meet the director as he was arranging the pieces and he took a moment to explain his intentions for the exhibition. If I hadn’t had been on such a tight schedule I would have gone out of my way to see some of his cinematic work, but with my tickets already booked and only two days in Jeonju, I was unable to see any of his films. 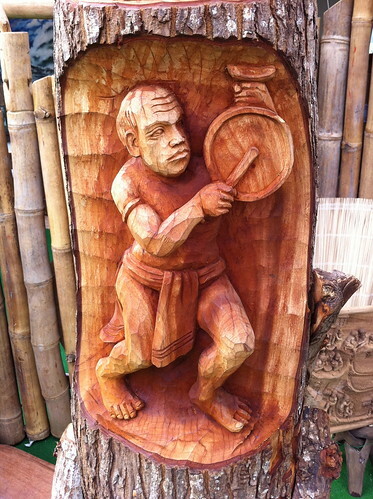 If anyone has any idea how I can get my hands on the work of Kidlat Tahimik, I’d love to know. Sculpture up close and personal. Onto Megabox and the first film of the day.